Ideal for new, relocating or expanding businesses, Valley View Business Park provides a great location with access to a skilled workforce and vast natural resources. Strategically located along the I-81 Corridor, more than 99 million consumers can be reached within a 500 mile drive-making Valley View Business Park a desirable location for any industry. 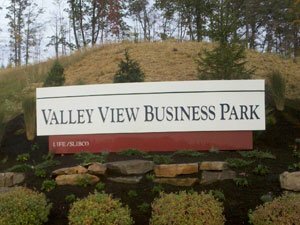 Developed by the Scranton Lackawanna Industrial Building Company (SLIBCO) in 2003, with a Phase II expansion in 2007, Valley View Business Park is a mixed-use business park, part of a 1,300-acre development project. Park tenants include TMG Health, McLane Company, Pasqualichio Brothers Inc., and Cardinal LG. Valley View Business Park offers numerous sites with Keystone Opportunity Expansion Zone (KOEZ) designation. KOEZ-eligible tenants may be exempt from Pennsylvania state and local business taxes through 2019, 2020 and 2024, depending upon the site designation. Sites within the Valley View Business Park, that are in the Borough of Jessup, qualify for tax abatements under the Opportunity Zone Program, a component of the Federal Tax Cuts and Job Act. Valley View Business park is a mixed-use business park with infrastructure in place to support an array of businesses operations ranging from office to manufacturing, small to large-sized operations. SLIBCO has developed the park with utilities existing in the roadway. This will allow for the extension of the utilities from the roadway direct to the site, reducing construction expenses. The park is served by a 10” PVC main. Sites within the park are served via 8” laterals and 3” low pressure forced mains. The Lackawanna River Basin Sewer Authority treats the effluent at their Throop treatment plant. Telecommunications service is provided by Verizon, Comcast, Frontier Communications and Level 3 Communications. Telecommunications infrastructure, with fiber is in place within the park. In addition, the park offers wireless telecommunication service via the Lackawanna County Wireless Initiative. This service is a quick and cost-effective connectivity readily available as a resource for business and economic development throughout Lackawanna County. PA American Water Company services the park via a 12” ductile iron main with 8” lateral to each site. Available system pressure range from 55 to 137 p.s.i.